I had an interesting exchange with Dez Blanchfield from Australia on twitter recently. At the time, based on his tweets, I assume Dez was an IBM employee. He isn’t and although our paths crossed briefly at the company in 2007, as far as I’m aware we never met. The subject was open vs open source. Any longtime readers will know that’s part of what drove me to join IBM in 1986, to push back on the closing of doors, and help knock down walls in IBM openness. 2/ there is now some form of Opensource built into almost everthing tech wise these days, if it has an IP address, then it has Opensource going back to as early as 1974 in fact, even Windows uses Opensource across so much of their Kernel, Operating System, Network Stack etc..
At the end of our twitter exchange, the first 3-tweets are included above, I promised to track down one of my earlier papers. As far as I recall, and without going through piles of hard copy paper in storage, this one was formally published by IBM US using a similar name, and pretty much identical content, probably in the Spring 0f ’96. It is still important to differentiate between de jure and de facto standards. Open Source creates new de facto standards every day, through wide adoption and implementation using that open source. While systems ,ove much more quickly these days, at Internet speed, there is still a robust need to de jure standards. Those that are legally, internationally and commonly recognised, whether or not they were first implemented through open source. Most technology standards these days are as that’s the best way to get them through standards organizations. The PDF presented here is original, unedited, just converted to PDF from Lotus Word Pro. Lotus Word Pro, and it’s predecessor, Ami Pro, are great examples of de facto standards, especially inside IBM. Following the rise of Microsoft Word and MS Office, Lotus products on the desktop effectively disappeared. Since even inside IBM, the Lotus source code was never available, not only were the products only a de facto standard, they were never open source. While in the post Lotus desktop software period considerable effort has been put into reverse engineer the file formats , and some free and chargeable convertors almost all of them can recover the text, most do a poor job or formatting. For that reason, I bought a used IBM Thinkpad T42 with Windows XP; Lotus Smartsuite and still have a licensed copy of Adobe Acrobat to create PDF’s. Words matter, open source, open, and open standards are all great. As always, understand the limitations of each. There are a load of my newer white papers in the ‘wayback’ machine, if you have any problems finding them, let me know, I’ll jump start the Thinkpad T42. When I first started in IT in 1974 or as it was called back then, data processing, open source was the only thing. People were already depending on it, and defending their right to access source code. I’m delighted with the number and breadth of formal organizations that have grown-up around “open source”. They are a great thing. Strength comes in numbers, as does recognition and bargaining power. Congratulations to the Open Source Initiative and everything they’ve achieved in their 20-years. I understand the difference between closed source, (restrictive) licensed source code, free source, open source etc. The point here isn’t to argue one over the other, but to merely illustrate the lineage that has led to where we are today. Perhaps one of the more significant steps in the modern open source movement was the creation in 2000 of the Open Source Development Labs, (OSDL) which in 2007 merged with the Free Standards Group (FSG) to become the Linux Foundation. But of course source code didn’t start there. Some people feel that the source code fissure was opened when Linus Torvalds released his Linux operating system in 1991 as open source; while Linus and many others think the work by Richard Stallman on the GNU Toolset and GNU License started in 1983, was the first step. Stallman’s determined advocacy for source code rights and source access certainly was a big contributor to where open source is today. But it started way before Stallman. Open source can not only trace its roots to two of the industries behemoths, IBM and AT&T, but the original advocacy came from them too. Back in the early 1960’s, open source was the only thing. There wasn’t a software industry per se until the US Government invoked its’ antitrust law against IBM and AT&T, eventually forcing them, among other things, to unbundle their software and make it separately available as well as many other related conditions. The U.S. vs.I.B.M. antitrust case started in 1969, with trial commencing in 1975(1). 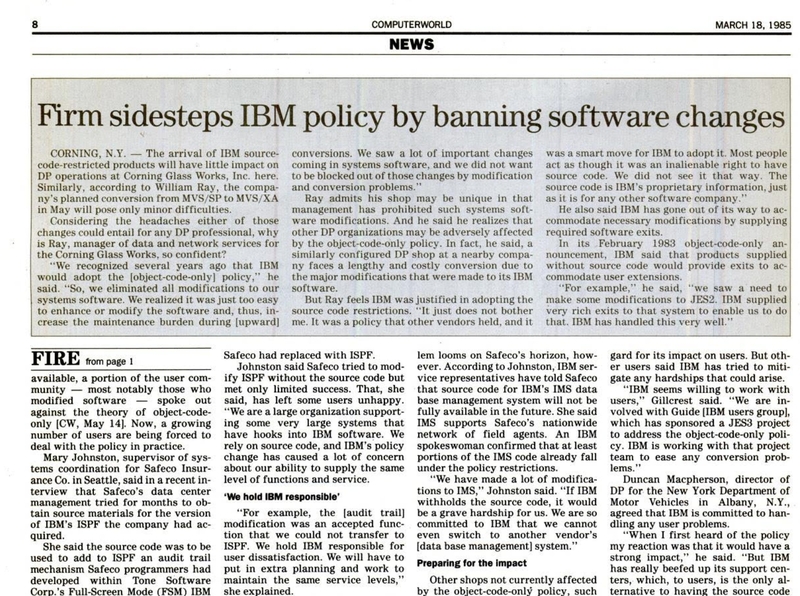 The case was specifically about IBM blocking competitive hardware makers getting access and customers being able to run competitive systems, primarily S/360 architecture, using IBM Software. In the years leading up to 1969, customers had become increasingly frustrated, and angry at IBM’s policy to tie it’s software to its hardware. Since all the software at that time was source code available, what that really meant was a business HAD to have one IBM computer to get the source code, it could then purchase an IBM plug-compatible manufacturers (PCM) computer(2) and compile the source code with the manufacturers Assembler and tools, then run the binaries on the PCM systems. IBM made this increasingly harder as the PCM systems became more competitive. Often large previously IBM only systems users who would have, 2, 4, sometimes even 6 IBM S/360 systems, costing tens of millions of dollars, would buy a single PCM computer. The IBM on-site systems engineers (SE) could see the struggles of the customer, and along with the customers themselves, started to push back against the policy. The SE job was made harder the more their hands were tied, and the more restrictions that were put on the source code. To SHARE or not to? a vast experience in source code distribution, it’s user created content, tools tapes were legend, what most never knew, is that back in 1959, with General Motors, SHARE had its own IBM mainframe (709) operating system, the SHARE Operating System (SOS). At that time there was formal support offerings of on-site SE’s that would work on problems and defects in SOS. But by 1962, IBM had introduced it’s own S/7090 Operating System, which was both incompatible with SOS, and also at that time IBM withdrew support by it’s SE and Program Support Representatives (PSR’s) to work on SOS. To my knowledge, that’s where the open source code movement, as we know it today, started. Stallman’s experience with a printer driver mirrors exactly what had happened some 20-years before. The removal of source code, the inability to build working modifications to support a business initiative, using hardware and software ostentatiously already owned by the customer. IBM made it increasingly harder to get the source code, until the antitrust case. By that time, many of IBMs customers had created and depended on small, and large modifications to IBM source code. By the mid-70’s, once of the results of years of litigation, and consent decrees in the United States, IBM had been required to unbundle its software, and make it available separately. Initially it was chargeable to customers who wanted to run it on PCM, non-IBM systems, but overtime as new releases and new function appeared, even customers with IBM systems saw a charge appear, especially as Field Developed Programs, moved to full Program Products and so on. In a bid to stop competing products, and user group offerings being developed from their products, this meant the IBM Products were increasingly supplied object-code-only (OCO). This became a a formal policy in 1983. I’ve kept the press cutting from ComputerWorld(March 1985) shown above since my days at Chemical Bank in New York. It pretty much sums-up what was going on at the time, OCO and users and user groups fighting back against IBM. What this also did is it gave life to the formal software market, companies were now used to paying for their software, we’ve never looked back. In the time since those days, software with source code available has continued to flourish. With each new twist and evolution of technology, open source thrives, finds it’s own place, sometimes a dominant position, sometimes subservient, in the background. The times in the late 1950’s and 60’s were the dawn of open source. If users, programmers, researchers and scientists had not fought for their rights then, it is hard to know where the software industry would be now. (1) The PCM industry had itself come about as a result of a 1956 antitrust case and the consent decree that followed. (2) The 1969 antitrust case was eventually abandoned in 1982. 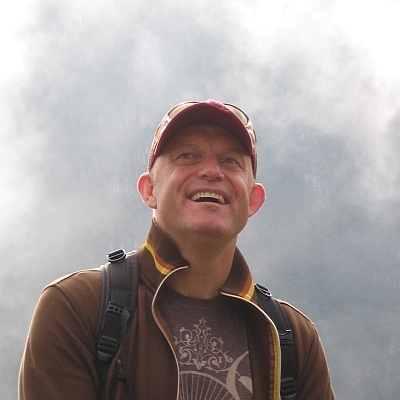 I'm Mark Cathcart, formally a Senior Distinguished Engineer, in Dells Software Group; before that Director of Systems Engineering in the Enterprise Solutions Group at Dell. Prior to that, I was IBM Distinguished Engineer and member of the IBM Academy of Technology. I am a Fellow of the British Computer Society (bsc.org) I'm an information technology optimist. I was a member of the Linux Foundation Core Infrastructure Initiative Steering committee. Read more about it here.